IRMOF-3 with a high surface area prepared by a hydrothermal method was used for deposition of Pd(OAc)2 on IRMOF-3 particles. The final catalyst was characterized with FT-IR, nitrogen physisorption, thermogravimetry, scanning electron microscopy, transmission electron microscopy combined with energy dispersive X-ray analysis, wide angle X-ray diffraction spectroscopy and X-ray photoelectron spectroscopy. The prepared porous catalyst was effectively used in the Heck coupling reaction in the presence of an organic base. The reaction parameters such as the type of base, amounts of catalyst and solvents, temperature were optimized. The catalyst was then easily separated, washed, and reused 4 times without significant losses of catalytic activity. 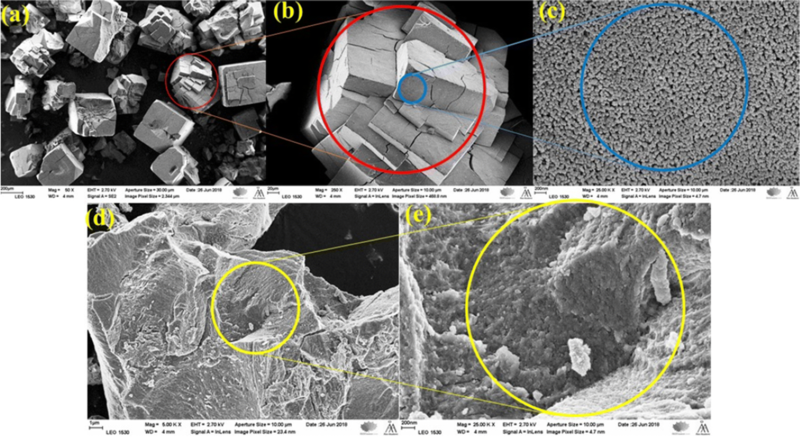 Recently metal–organic frameworks (MOFs), porous materials of a crystalline structure comprising bridged organic ligands and metal centers, have been attracted significant attention in gas sorption average owing to their large pore volumes and surface areas. Several studies have been reported on MOFs utilization as heterogeneous catalysts [1, 2, 3, 4], in gas storage , separation , drug delivery , and sensing [8, 9]. These materials have been explored because of their intrinsic high surface area, tunable pores, and various functionalities . 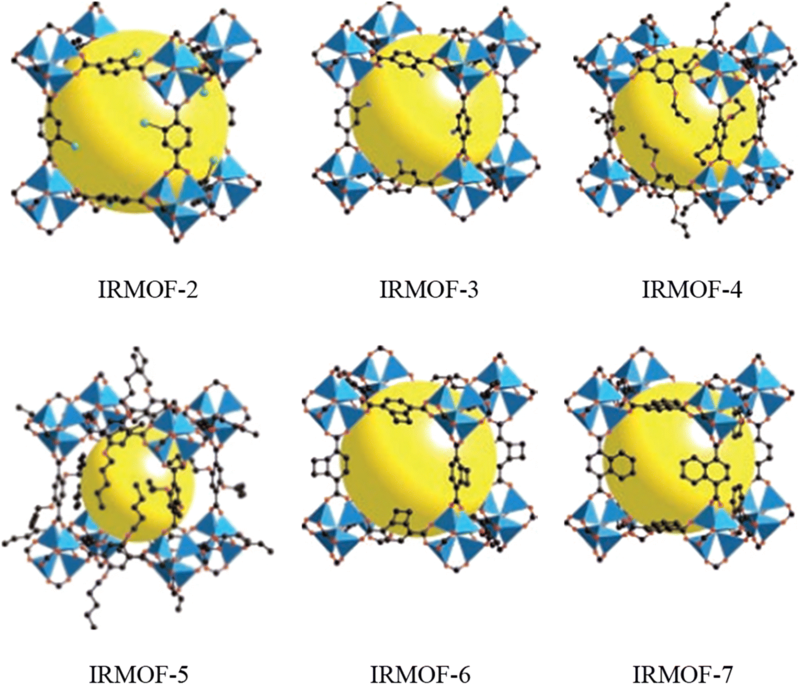 The IRMOF series based on MOF-5 was synthesized possessing octahedral clusters with carboxylate linear linkers. IRMOF-1 formed an oxide-centered Zn4O tetrahedron by six carboxylate edges giving the octahedral shape that reticulates into a three dimensional (3D) cubic porous system. The IRMOFs pore size and structure depend on the functional groups on the linkers. When the linkers have different functional groups such as bromo, amino, n-propoxy, n-pentoxy, cyclobutyl, and fused benzene, effective structures ranging from IRMOF-2 through IRMOF-7 (Fig. 1) can be synthesized . Each of the different type of IRMOFs has a specific single-crystal X-ray diffraction spectroscopy (XRD) pattern. A high flexibility of these compounds allows synthesis of several types of MOFs with ultrahigh surface area and high thermal stability. For example, in the case of MOF-5 decomposition of the structure happens at as high temperature region as between 350 and 400 °C . In terms of the framework structure, the MOFs have different types such as extra-high porosity frameworks IRMOF-1, square channels (MOF-2), hexagonally packed cylindrical channels (MOF-74), MOF-177, interpenetration (IRMOF-11), alkyl- and amino-functionalized pores (IRMOFs-6 and -3) and pores decorated with open metal sites (MOF-505 and Cu3 (BTC)2) . Babarao et al. studied storage and separation of CO2 and CH4 with silicalite, C168 schwarzite, and IRMOF-1 . The authors compared the materials and reported that IRMOF-1 has a considerably higher adsorption volume than other adsorbents, while the adsorption selectivity of CO2 over CH4 was found to be similar. IRMOF-14 and IRMOF-16 being nontoxic were found to afford high-loading capacity for drug delivery. The results showed that the hydrogen atom with a hydroxyl moiety in the organic linker of IRMOF-14 and IRMOF-16 is the key for hydrogen bonding and acid–base interactions with Tamoxifen . Phan et al. synthesized a highly porous IRMOF-3 from the reaction of zinc nitrate hexahydrate and 2-amino-1,4-benzenedicarboxylic acid by a solvothermal technique. This catalyst was used for the Paal–Knorr reaction of benzyl amine with 2,5-hexanedione confirming that IRMOF-3 is an efficient heterogeneous catalyst to form 1-benzyl-2,5-dimethyl-1H-pyrrole as the major product . Several techniques have been developed for coupling of C–C bond, which can be exemplified by Heck , Suzuki , Negishi , Sonogashira , Kumada , and Stille coupling reactions, etc. Various metals such as palladium, rhodium, ruthenium, copper, zinc, tin, magnesium, etc . have been used. One of the fundamental transformations in organic chemistry is the Heck reaction used for reacting substituted halobenzenes and vinyl halides with olefins (Scheme 1). In general, the reaction of alkyl halides with olefins is not satisfactory, because of a premature β-hydrogen elimination and slow oxidative addition rates . Challenges to enhance the scope of enantioselective Heck reactions have been very recently well documented . Kong et al. reported palladium-catalyzed intramolecular asymmetric enantioselective Heck reactions in the presence of diboron–water as a hydride source . Bao et al. described palladium-catalyzed enantioselective Narasaka–Heck reaction in the presence of an achiral bidentate phosphine ligand with direct C–H alkylation of arenes . A highly effective tool for deposition of various metals including palladium and platinum is chemical vapor deposition of organometallic compounds. Sabo et al. 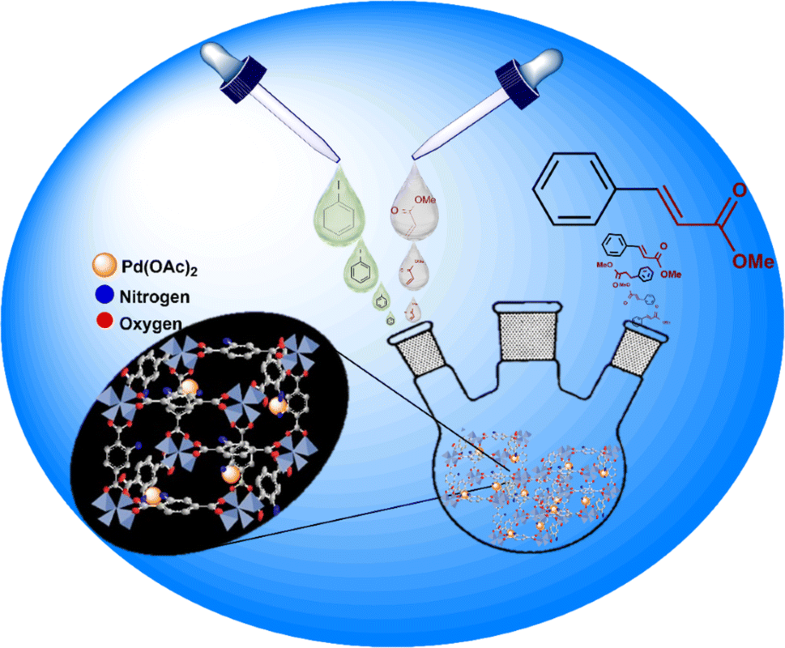 deposited palladium into a highly porous metal–organic framework MOF-5 by palladium acetoacetate in CHCl3 solution via the “incipient wetness” impregnation and studied catalytic behavior in styrene hydrogenation. Park et al. prepared a highly dispersed palladium (II) in a defective metal-organic framework for C-H activation and functionalization of naphthalene . 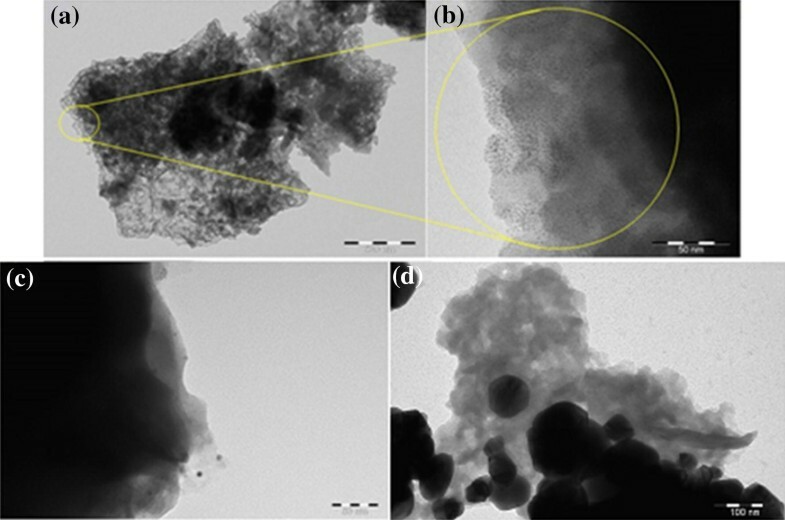 In this work deposition of palladium acetate on the surface of IRMOF-3 was performed to develop a highly active and reusable heterogeneous catalyst for the Heck coupling reaction. Zinc nitrate hexahydrate, 2-aminoterephthalic acid, Pd(OAc)2, iodobenzene, ethyl acrylate and bases were obtained from Sigma Aldrich and used without further purification. Other solvents and chemicals were of laboratory grade, obtained from Alfa and used without further purification. In order to synthesize IRMOF-3, zinc nitrate hexahydrate (3.720 g, 12.5 mmol) and 2-aminoterephthalic acid (0.750 g, 4.15 mmol) were dissolved in dry DMF (100 mL). The mixture was placed into an autoclave heated at 100 °C for 24 h, following by slow cooling to room temperature. The solid products after filtration were washed three times with DMF. For removal of DMF from the pores immersion two times into CH2Cl2 for 12 h was done [29, 30]. Activated IRMOF-3 particles (1.000 g) were dispersed in CH2Cl2 (30 mL), following by addition of Pd(OAc)2 (50 mg) and stirring for 24 h. Thereafter, the solid catalyst was separated by centrifugation and washed several times with CH2Cl2 and dried under vacuum at 150 °C for 24 h to give IRMOF-3-Pd (3.5 wt% Pd detected by ICP-OES) . The procedure for the catalyst synthesis is given in Scheme 2. The functional groups on the solid compounds were investigated by infrared spectroscopy (ATI Mattson FTIR). 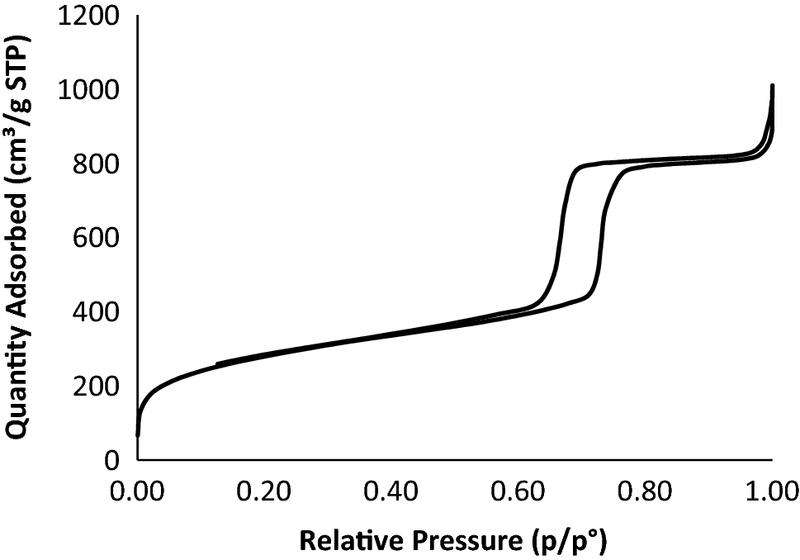 The specific surface area and pore volume were determined by N2 adsorption/desorption using a Sorptometer 1900 apparatus (Carlo-Erba Instruments). The morphology and crystal size distribution were studied by a scanning electron microscope (Zeiss Leo 1530 Gemini) equipped with a Thermo-NORAN vantage X-ray detector. Elemental analysis was performed with the same instrument. The IRMOF-3 and IRMOF-3-Pd size distributions images were obtained by transmission electron microscopy (TEM) using by EFTEM, LEO 912 OMEGA, LaB6 filament, 120 kV. Thermogravimetry (TGA) curves were recorded on a CAHN D-200 instrument for the powder samples (scanning rate 10 °C/min to 600 °C). The content of palladium in the catalyst was determined by inductively coupled plasma-optical emission spectroscopy (ICP-OES), using an Optima 4300 DV optical atomic emission spectrometer. The XRD measurements were carried out on a Bruker AXS D8 Discover instrument equipped with a Cu Kα X-ray source and scintillator point detector. The samples were scanned in the 1°–70° 2θ range, with an increment of 0.04° and at a scan speed of 8 s per point. 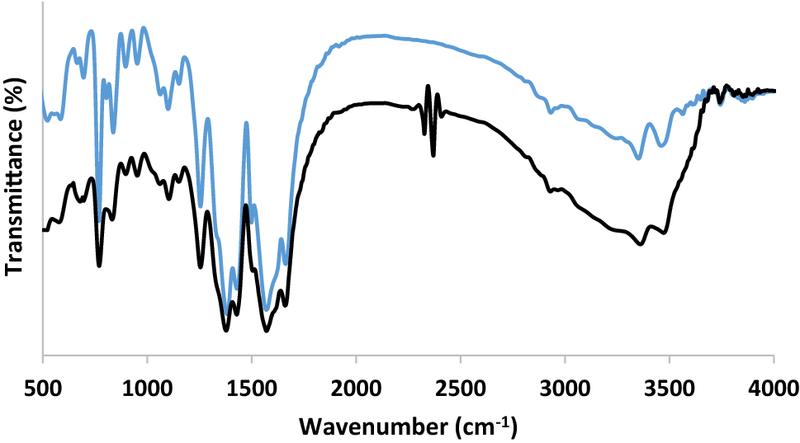 The progress of the reaction was analyzed by GC equipped with FID system using HP 6890 Series with HP-5, 5% phenyl methyl siloxane capillary column (30.0 m × 320 µm, 0.25 µm). The injector temperature was 280 °C, while the gas flow was 9.5 mL/min. Hexadecane was used as an internal standard. The reaction was performed at 120 °C in the 14 mL round bottom vial with stirrer. The reaction mixture contained 0.2 mmol of iodobenzene, 0.3 mmol of methyl acrylate, 0.3 mmol of triethylamine (Et3N), 0.001 g of IRMOF-3-Pd as a catalyst (0.165 mol% Pd to aryl halide) and 0.5 mL DMA (dimethylacetamide) as a solvent. The reaction progress was followed by TLC and after completion analyzed with GC. The catalyst was separated from the reaction mixture by filtration and then it was washed with DMA and ethyl acetate. IRMOF-3 was studied using different characterization techniques. In the FT-IR spectra characteristic bands revealed the presence of functional organic groups on IRMOF-3 and IRMOF-3-Pd as shown in Fig. 2. The peaks of asymmetric and symmetric stretching vibrations of amino groups are visible at 3477 and 3355 cm−1. The strong bands at 1662–1382 cm−1 are related to symmetrical and asymmetrical O–C=O vibrations of dicarboxylate and C=C in the benzene ring. A strong peak at 1255 cm−1 is assigned to C−N stretching. The aromatic C−H bending at 1103 and 833 cm−1 also appeared in the spectra of IRMOF-3 [32, 33]. The SEM images show that the IRMOF-3 is highly crystalline displaying well-shaped cubic crystals (Fig. 3a–c). After deposition of palladium acetate on the surface, the cubic structures have been partially destroyed (Fig 3d, e). In order to identify the elemental composition of IRMOF-3-Pd EDX at random points on the surface of the catalyst was performed (Fig. 4). The EDX results indicate that palladium deposited on catalyst are at least to some extent ligated with chlorines that originates from CH2Cl2 that was used during catalyst preparation. The measurements confirmed the presence of palladium, zinc, oxygen, nitrogen and carbon in the supported catalyst. The weight % and atomic % of different components are shown in Table 1. Transmission electron microscopy (TEM) was performed to determine the MOF particle size. The porous structure of the IRMOF-3 is clearly visible in the TEM images (Fig. 5a, b). After deposition of palladium acetate on IRMOF-3, palladium (II) has been converted into metallic palladium, which is visible as the metal clusters with the size below ca. 6 nm (Fig. 5c). These clusters tend to grow. After four Heck cycles they formed much bigger agglomerates (Fig 5d) which probably caused drop of the activity. 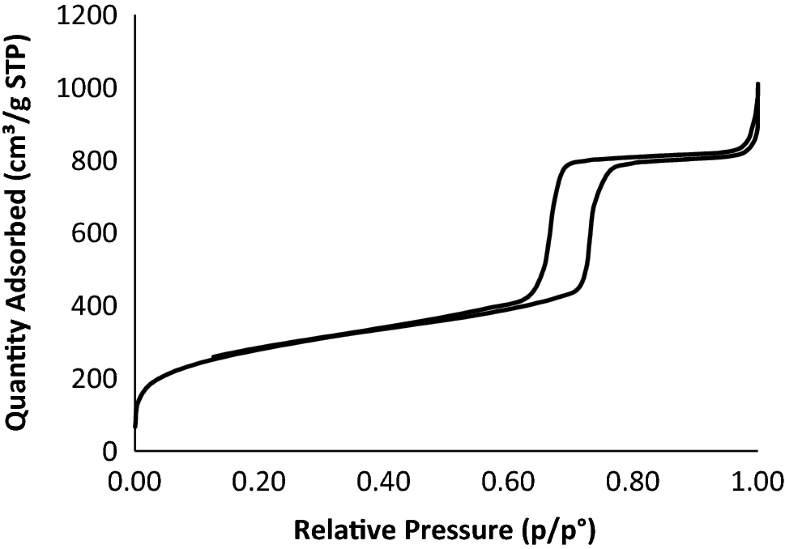 The nitrogen adsorption-desorption isotherms for IRMOF-3 is shown in Fig. 6. The BET surface area for IRMOF-3 was calculated to be 996 m2/g. After deposition of palladium on the surface of IRMOF-3 the surface area was diminished to 810 m2/g. The Pd loading was optimized to keep IRMOF-3 structure and high porosity. Low angle X-ray diffraction (XRD) patterns of IRMOF-3 and IRMOF-3-Pd are presented in Fig. 7a. Diffraction peaks of the supporting material (Fig. 7a—black pattern) were observed at 2θ = 6.8, 9.8 and 13.8 which is in agreement with the structure of IRMOF-3 . After palladium deposition the intensity of peaks has been slightly decreased but they were still present showing that the crystal structure of IRMOF-3 is preserved (Fig. 7a—red pattern). However, after the reaction only the peak of a lower intensity at the 2θ = 9.8 indicating that framework was preserved only to a certain extent (Fig. 7b). The thermogravimetric analysis (Fig. 8) reflects the thermal stability of IRMOF-3. The IRMOF-3 exhibited two main weight losses, the first one (app. 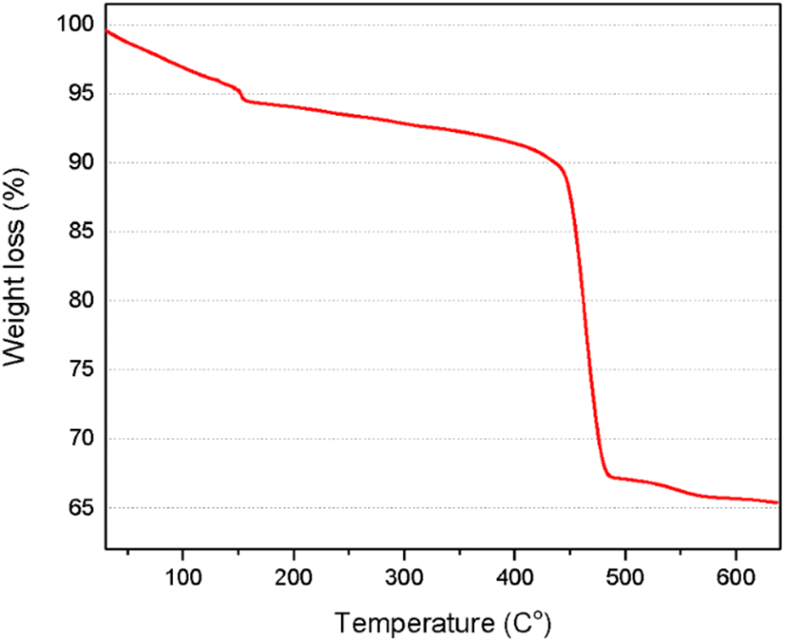 7%) in the temperature range below 400 °C, corresponding to the loss of water from the pores of metal organic frameworks as well as aromatic groups and unreacted molecules. A second more prominent mass loss of 27% above 400 °C is related to decomposition of the organic frameworks. X-ray photoelectron spectroscopy (XPS) analysis, giving information on the metal oxidation state, is presented in Fig. 9a, which displays that the fresh catalyst contains palladium in the form of Pd(II) having the characteristic 3d5/2 and 3d3/2 peaks at 337.6 and 342.9 eV binding energies. After the reaction (Fig. 9b) all Pd was converted to the metallic Pd(0) form with binding energies at 335.7 and 340.9 eV, in agreement with TEM analysis. Besides these peaks, an additional peak at around 343.8 eV was observed, being evidently more prominent in the spectra of the recycled catalyst. It can be speculated that this peak originates from Pd forming an alloy with zinc which can result in significant electron disorder similar to previous reports [35, 36]. The reaction conditions were optimized by conducting the coupling reaction of iodobenzene and methyl acrylate, as model substances, and changing the reaction parameters including the base type, the solvent, the catalyst amount and reaction temperature. The results are summarized in Table 2. Methyl acrylate is typically added in excess  to compensate evaporation, moreover unreacted iodobenzene in the reaction mixture causes high leaching of palladium from the catalyst . Experiments with various solvents (entry 1–10) revealed that dimethylacetamide (DMA) was the most efficient solvent (entry 1, 3.6% yield). After a careful screening of different bases (entries 11 to 18), Et3N was found to give the highest yield of the coupling product (entry 15, 88.8% yield). Solubility of the inorganic bases is very poor in the organic systems, while triethylamine is miscible in the slurry of the Heck reaction. This is the main reason for high conversion in the presence of triethylamine as a base . Additionally, commonly used Heck solvents such as DMF and NMP are tested with Et3N base to avoid any uncertainty with choice of solvent/base system (entries 19, 20). The effect of Pd loading was investigated showing that the highest activity was observed by using 0.165 mol% of palladium (entry 21, 5.2% yield). 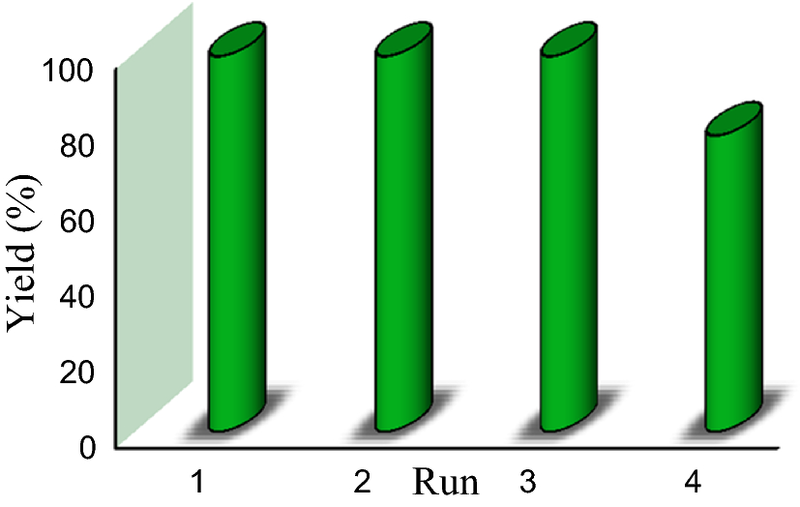 Based on plotted results for different catalyst amounts (Fig. 10a) the reaction order in the catalyst was calculated to be 0.70. A deviation from first order kinetics is expected due to formation of inactive palladium dimers when a relatively high Pd to halide ratio is used. Smaller amounts of palladium than used in the current work would probably lead to the first order reaction, however, such small amounts are very difficult to handle experimentally. 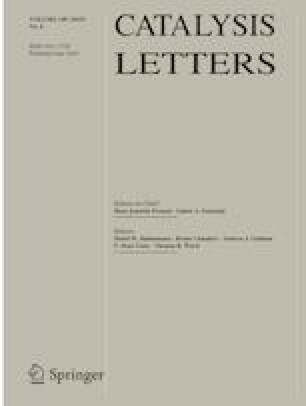 The reaction order in the catalyst determined in the current work is in good agreement with a recently published kinetic study by Bures, who reported the values of 0.55–0.86 depending on Pd loading . Furthermore, by increasing the reaction temperatures (entries 25 to 28) reaction rate increases linearly which is explained typically by Arrhenius type dependence of the rate constants on temperature as well as by a faster redisposition of Pd on the catalyst at elevated temperature . The apparent activation CPd energy (Fig. 10b) was calculated to be 18.4 kJ/mol. Without any catalyst the reaction between iodobenzene and methyl acrylate did not give any product (Entry 24). In Table 3, the catalytic activity of the IRMOF-3-Pd in the Heck cross-coupling reaction of iodobenzene with methyl acrylate is compared with some catalysts reported in the literature. As can be seen, IRMOF-3-Pd is more effective than the previously studied catalysts for the Heck reaction. It should be also noted that the values of TOF presented for IRMOF-3-Pd (Table 3, entry 6), as well as for some other entries in the same Table (entries 1–3) certainly underestimate the real catalytic activity especially during the initial period, as they are calculated at 100% conversion. Catalyst recyclability is one of the important factors in catalysis. In this respect, leaching of palladium, stability and reusability of supported IRMOF-3-Pd was studied in the Heck cross-coupling reaction of iodobenzene and methyl acrylate as a model substrate under optimal conditions. In order to reuse the catalyst, the IRMOF-3-Pd was separated by centrifuge after each cycle, washed with diethyl ether and ethyl acetate. A certain decline in activity can be seen (Fig. 11), which most probably can be attributed to palladium agglomeration (Fig. 5d) and leaching. In the first cycle 17% of Pd leached in the mixture of the reaction. Such leaching is in line with the current mechanistic views on the Mizoroki-Heck reaction with heterogeneous catalysts [44, 45, 46] suggesting that the reaction involves dissolution of Pd from the support with subsequent redeposition of formed Pd species in the solution. The latter colloidal type of species are thus considered catalytically active. In the present study, IRMOF-3 was prepared by a hydrothermal method and after deposition of palladium acetate, was used as a heterogeneous catalyst for the Heck cross-coupling reaction. IRMOF-3 and IRMOF-3-Pd were characterized by FT-IR, nitrogen physisorption, transmission electron microscopy (TEM), scanning electron microscopy (SEM) combined with energy dispersive X-ray analysis (EDX), broad angle X-ray diffraction spectroscopy (XRD) and X-ray photoelectron spectroscopy (XPS). The results have demonstrated that the IRMOF-3 is a suitable support for deposition of palladium acetate, which can efficiently catalyze the Heck reaction between iodobenzene and methyl acrylate. Open access funding provided by Abo Akademi University (ABO). This work is part of the activities at the Åbo Akademi University Johan Gadolin Process Chemistry Centre within the Centre of Excellence Programme appointed by ÅAU, Finland. In Sweden the Bio 4 Energy programme is acknowledged.